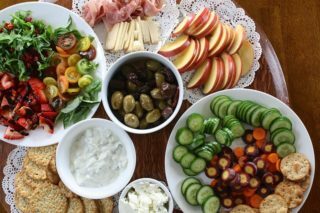 It may not always seem like there are many options when it comes to finding healthy appetizers on that buffet spread at the office party or that family reunion this holiday season. Here at Weddington Dentistry, an amazing option here at home in Concord, North Carolina, we want to help. You may be surprised what snacks are actually good for your teeth and overall oral (or general) health. Take a second to think before reaching into that bowl of Chex Mix and look for a few other common appetizer options that may help you more in the long run. Many places will likely have most of the same options when it comes to appetizers, so there are some general rules of thumb to look for. One common option is chips and sauce of some kind. Tortilla chips and salsa, for example, may be a tantalizing option while you are standing around socializing. However, the acids from the sauce can wreak havoc over time and unless you carry a toothbrush with you, it can be hard to get out those little pieces of chip from between your teeth. These can lead to further issues. Bread based options like bread/spinach dip platters are okay options because they are soft and gentle on teeth while the dip is rich in calcium and other nutrients. However, the best option is, without a doubt, fruit or veggie based options. The crunch/texture of veggies can actually help to clean your teeth a little. Plus, they are low in sugar, and they are nutrient-rich and filling. However, you aren’t limited to just veggie platters. While those are good too, look around. Unbuttered popcorn is good for your smile, for example, but definitely wouldn’t come on a platter. More than that, there are plenty of ways to dress up veggies to make them look and taste amazing. For example, you can try making buffalo cauliflower puffs instead of buying wings! You may be surprised what you find. More than anything, though, try to avoid mindlessly snacking on candies, cakes, or other sweets. These are not only bad for your teeth, but the rest of you as well. Healthy appetizers can be fun for the whole family and are a much better alternative this holiday season. Whether you are at a party or hosting one, try to be conscious of what you can do to help yourself and those around you. If you are curious to learn more, call us at Weddington Dentistry. We would be more than happy to answer any questions you may have. We are honored that you have chosen Weddington Family Dentistry and we appreciate the trust you have placed in us. We are committed to being your partner in good oral health. We believe in establishing a long term relationship so we can get to know your unique needs and design a customized treatment program that will help you maintain a beautiful, healthy smile for life. © Weddington Family Dentistry 2017.